The Arizona Game and Fish Department's Local Sportsmen's Group Grant Program awarded 17 projects totaling $75,000 for hunter and angler recruitment efforts in the state. The purpose of the grant program is to help local Sportsmen's groups fund projects that promote wildlife conservation through hunter and angler recruitment and retention. Eligible projects often include events like mentored, hands-on hunting or fishing camps/programs for youngsters and their families. The program received 37 applications this cycle totaling nearly $240,000 in project requests. "We had an incredible response this year," said Doug Burt, hunting and shooting sports manager for Arizona Game and Fish. "The recruitment and retention of hunters, anglers, shooters and trappers is essential, and we strongly encourage projects that involve partnering among groups and organizations." Reaching out to Arizona residents who might not be familiar with the fishing and hunting opportunities in this state is essential to preserving the future of our outdoor traditions, and it is no small task. "This grant program is an investment in the local organizations that are critical in bringing important lessons about traditional outdoor recreational pursuits to our communities," Burt said. "Hunters and anglers are stewards of wildlife and a primary funding source for wildlife conservation efforts in Arizona and in most of the U.S."
Angler's United Lake Havasu City Chapter for the project "Lake Havasu Youth Fishing Education Program," in the amount of $3,063. Arizona Elk Society for the project "Arizona Elk Society Youth Camp Program, SAMI insurance, and Media Promotions," in the amount of $9,000. Arizona National Shoot to Retrieve for the project "Southeastern AZ Youth Quail Camp," in the amount of $2,000. CouesWhitetail.com for the project "Women's Javelina Hunting Camp 2014," in the amount of $4,775. Huachuca Gould's Chapter of National Wild Turkey Federation for the project "Huachuca Gould's Chapter Free Family Predator Hunting Camp," in the amount of $2,900. Mohave Sportsman Club for the project "Fishing for Smiles 2014," in the amount of $5,917. Mule Deer Foundation Arizona Chapter for the project "Mule Deer Foundation Punkin Center Junior Deer & Quail Forever Youth Quail Camp," in the amount of $5,500. Mule Deer Foundation Arizona Chapter for the project "Mule Deer Foundation Youth Deer Camp and Deer Hunting Clinic" in the amount of $6,000. National Wild Turkey Federation Arizona Chapter for the project "2014 Spring Juniors Turkey Hunting Camps," in the amount of $9,150. Red Bear Outfitters for the project "Picket Post Small Game Hunting Camp," in the amount of $3,000. Shoot for Life for the project "Junior Archery Javelina Hunt Camp," in the amount of $3,760. Southwest Fur Harvesters for the project "2014 Youth Trappers Camp," in the amount of $3,372. Youth Outdoors Unlimited for the project, "Family Fishing Camp at Lake Pleasant," in the amount of $3,990. Youth Outdoors Unlimited for the project "Junior Deer Camp in Unit 20 C," in the amount of $1,790. Youth Outdoors Unlimited for the project, "Wallow Fire Turkey Science and Hunting Camp in Units 1 & 27," in the amount of $3,628. Yuma Valley Rod and Gun Club for the project "2013 Quail and Small Game Camp," in the amount of $4,435. Yuma Valley Rod and Gun Club for the project "Yuma Valley Rod and Gun Club Fishing Clinic," in the amount of $2,720. 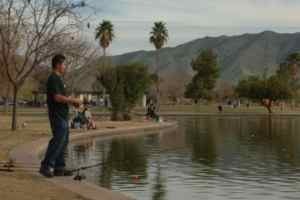 For details on how to participate at these events and others like them, visit www.azgfd.gov/outdoorskills. The Local Sportsmen's Group Grant Program was started in 2007 to provide financial assistance to local sportsmen's groups in supporting wildlife conservation. The program awards grant funds to eligible projects through a competitive application process each year. The focus of projects eligible to receive grant funds is determined annually by the Arizona Game and Fish Department and may change from year to year. There is no cost to Arizona taxpayers for this grant program. The Arizona Game and Fish Department does not receive any of the state's general funds, and operates on a user-pay, public-benefit model. The Local Sportsmen's Group Grant Program is an investment in the continuance of wildlife conservation efforts and outdoor recreation participation in the state of Arizona.